A commercial fire can cause devastating damages to a business, sometimes to the point where the business is completely lost. While there is no way to completely prevent a commercial fire from occurring within your building, there are steps that an owner can take to prevent serious damage. One way this can be accomplished is through smoke alarms. Smoke alarms can alert commercial building occupants of a fire to help ensure the safety of occupants and to prevent serious damage from occurring. 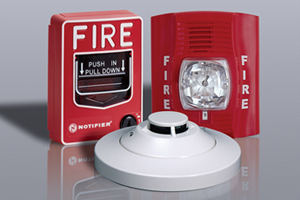 There are two different types of fires that can be detected by smoke alarms. This type of fire occurs when materials have been ignited and an actual flame is present. Some commonly found materials within a commercial business that tend to ignite include paper, wood, flammable liquids, and cooking equipment. When a flaming fire occurs, the fire is detected by the flames and no the smoke because of the lack of smoke. This type of fire typically occurs after a material has been ignited. A smoldering fire is most commonly caused by a cigarette. A smoldering fire creates a large amount of smoke and can potentially turn into a flaming fire if left unattended. In order to protect against both types of fires, consider installing the two different types of smoke alarms throughout the commercial building. Ionization smoke alarms should be used in areas where a small fire would occur while photoelectric smoke alarms should be used in areas where a larger fire could occur. Smoke alarms alert occupants of a fire while also allowing the proper authorities to be contacted quickly. Smoke alarms used in conjunction with sprinkler systems are the best way to keep building occupants safe and damage to a minimal. This entry was posted on Monday, April 20th, 2015 at 5:42 pm. Both comments and pings are currently closed.